2018 Kindness Challenge – Summer Style | I Don't Stink! Go to http://www.idontstink.com/kindness-challenge/ and see the details. We have a kindness meter that will grow with each kind deed. 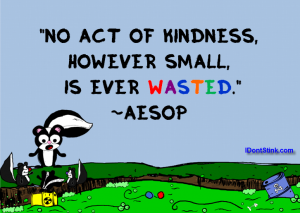 When you create a free account, you will have your very own kindness meter too! No pressure, no emails (unless you sign up for Daily Positive Points) so you don’t have to worry about SPAM from us. But it isn’t required that you have an account, it’s just fun stuff watching the meter grow. All you have to do is commit to deliver a single kind act a day. That’s it!